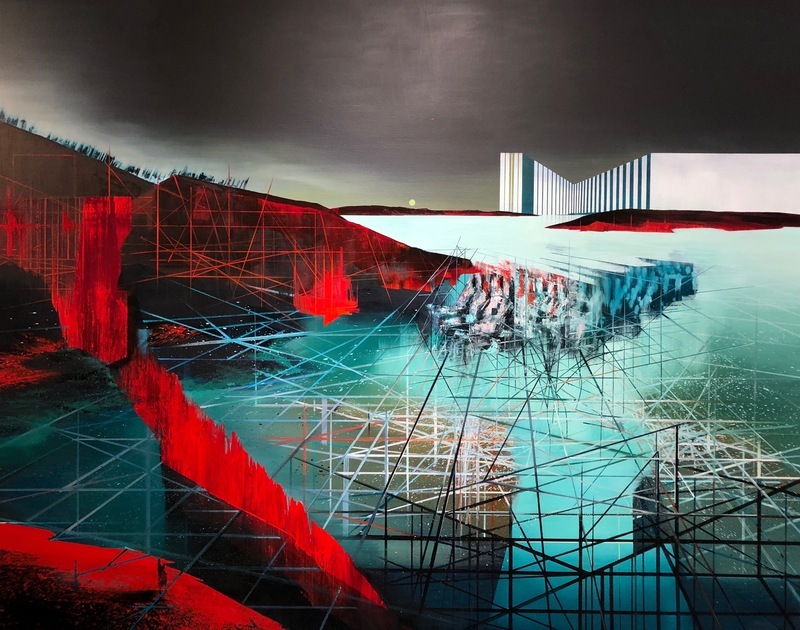 Channeling Chandigarh, Brasilia, and other modernist paradises gone awry, Tim Kent's oily landscapes caricature the futile dream of human geometries and nature cohabiting in peace. The reality yields a poisoned environment of Cadmium Red geysers and lampblack skies, as in Data Lake, or a maelstrom of radioactive yellow rain in Isotopia (both 2018). The artist veers between the more painterly brushwork of his earlier, warmer landscapes, and the optical effects and slight-of-hand of a scenic painter. In the more politically charged canvasses, furtive, phantom-like, suited figures conspire just beneath the surface, offering a psychological balance to the visceral uneasiness prompted by the bleak vistas and patterns of color that flicker like afterimages. The most successful works take their cues from late Turner, depicting shimmering, though sometimes decrepit architectural oases of visual relief from the frenetic onslaught of nature's retaliatory spurts of agony.